Adopted on July 21, 1945. The Eastern White Pine (Pinaceae Pinus strobus) is considered to be the largest conifer in the northeastern United States. The white pine was initially adopted as the official tree of the State of Maine, by Senate Resolve presented by Senator Clough of Penobscot in 1945. 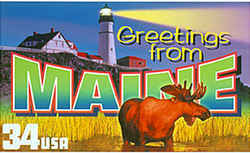 In Maine, Resolves are defined as having "the force of law but do not amend statutes." Therefore in "AN ACT to Correct Errors and Inconsistencies in the Public Laws," the white pine was given a promotion of sorts and elevated to a position in the Maine Revised Statutes by the Ninety-ninth Legislature. Legislative Document No. 1171 was presented by Senator Weeks of Cumberland. The effective date of this approved bill was September 12, 1959. Pinus strobus, commonly known as the eastern white pine, white pine, northern white pine, Weymouth pine, and soft pine is one of the most valuable trees in eastern North America. Eastern white pine(Pinus strobus) is a large pine tree native to eastern North America (occurring from Newfoundland west to Minnesota and southeastern Manitoba, and south along the Appalachian Mountains to the extreme north of Georgia). Before the arrival of white men, virgin stands contained an estimated 3.4 billion mÂ³ (600 billion fbm) of lumber. By the late 1800's most of those vast stands had been logged. 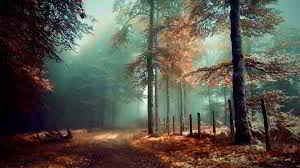 Because it is among the more rapid growing northern forest conifers, it is an excellent tree for reforestation projects, landscaping, and Christmas trees and has the distinction of having been one of the more widely planted American trees. This tree is known to the Native American Haudenosaunee (Iroquois nation) as the Tree of Peace. 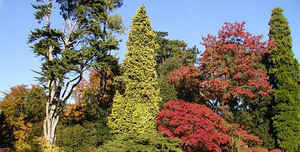 It is known as the Weymouth pine in the United Kingdom, after George Weymouth who brought it to England in 1620. Like all members of the white pine group, Pinus subgenus Strobus, the leaves ('needles') leaves (needles) are soft, flexible and bluish-green to silver green in color and are regularly arranged in bundles of five. 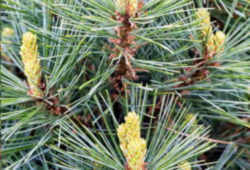 Needles are 2 1/2-5 inches long and are usually shed at the end of the second growing season. Flowers (strobili) occur on the tree. 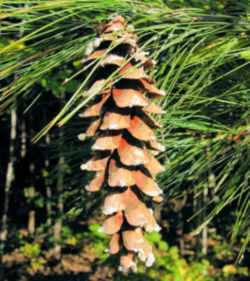 Cones are 4-8 inches in length, usually slightly curved. Cone scales are thin and never have prickles. Cones also have a fragrant gummy resin. Leaf: Evergreen, 3 to 5 inches long, with five blue-green, slender needles per fascicle. A fascicle sheath is not present. Needles appear blue because of 3 or more lines of stomata. Flower: Monoecious; males cylindrical, yellow, in clusters near branch tips; females light green, tinged in red, at ends of branches. Fruit: Cones are 4 to 7 inches long, cylindrical, with thin, rounded cone scales, very resinous. Cones are borne on a long stalk. Maturing August to September. Twig: Slender, gray-green to orange-brown in color. Bark: On young trees; thin, smooth and gray-green in color. Later becoming thick, reddish-brown to gray-brown with prominent ridges and furrows. Form: A large tree with a very straight stem. The crown is conical when young, later developing wispy, horizontal branches. Legislative Document No. 381 follows. RESOLVE, Designating the White Pine Tree as the State Official Tree. White pine tree, state official tree. 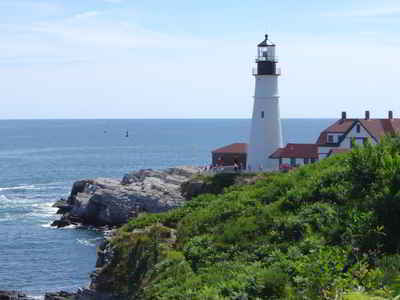 Resolved: That the white pine tree be, and hereby is, designated the official tree of the state of Maine. Legislative Document No. 1171 presented by Senator Weeks of Cumberland. The law designating the white pine tree as the official Maine state tree is found in the Maine Revised Statutes, Title 1, Chapter 9, Subchapter 1, Section 208. 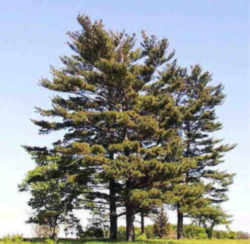 The official tree of the State shall be the white pine tree.